BRUSSELS, Belgium -- Ukrainian Prime Minister Mykola Azarov on Wednesday brushed aside Western concerns about his government's treatment of opposition leader Yulia Tymoshenko as misguided and unwarranted, indicating that Kiev was unlikely to change its mind. Ukrainian Prime Minister Mykola Azarov. The EU has condemned the sentencing of former prime minister Tymoshenko - the top opponent of President Viktor Yanukovich - to seven years in prison last October as politically motivated. Tymoshenko, who was found guilty of abusing her powers as prime minister in forcing through a 2009 gas deal with Russia, has denied any wrongdoing and said Yanukovich was pursuing a personal vendetta against her. The European Union has urged Tymoshenko's release and warned Ukraine its 27 members would otherwise refuse to ratify landmark agreements on political association and free trade with Kiev. Azayov agreed to European Parliament proposals to send a monitor to Tymoshenko's appeal hearing and a group of medical experts to assess the health of the opposition leader who is now being treated for chronic back pain. But Azarov, who addressed the European Parliament on Wednesday during his visit to Brussels, indicated his government would not yield to Western pressure, according to a transcript of his speech provided by the European Centre for a Modern Ukraine, a Brussels-based lobbying group for Ukraine. "I am convinced that we shall overcome temporary difficulties created by our political opponents, unscrupulously misinforming and deluding you, using certain ... manipulative techniques and hired provokers-professionals," Azarov said. "It is clear that the status of a politician, MP, or even former prime minister must not be used as an excuse to commit crimes," he said in an apparent reference to Tymoshenko. 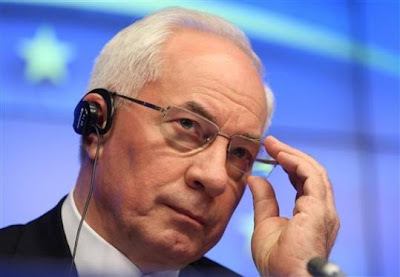 Azarov also said that "not all defense procedures have been exhausted" in Tymoshenko's case. A Ukrainian court looking into her appeal put off hearings until June 26 this week, sidestepping the difficult decision ahead of the European soccer championship which Ukraine will co-host with Poland next month. Some European leaders have called for a political boycott of the championship, although the bloc has yet to come up with a unified position. In his English-language speech, Azarov launched a counter-attack on critics. "It is in vogue these days to criticize Ukraine, and to let rip short-term emotions and long-held stereotypes. The image of Cato the Elder, the Roman commander, and his famous bywords 'Carthage must be destroyed' come readily to mind," he said. "It is no secret that the current state of Ukraine's relations with the EU is far from the best it can be. The very wide spectrum of our previous relations has narrowed to become hostage to just one sole issue. This is both counter-productive and short-sighted." Tymoshenko, 51, was a leader of the 2004 Orange Revolution protests that dealt a blow to Yanukovich by forcing a re-run of the presidential election which he had won. Yanukovich lost the re-run but staged a successful comeback in 2010. Since then, Tymoshenko and a number of her allies in the opposition have faced criminal charges in what she has described as a campaign of repression. Yanukovich has said his government was merely fighting corruption.